My mother was a strong woman. She had me, her third child, when she was 48-years old. My dad was 50. She started to come down with dementia around 2006, and we are not sure, but it could very well have been Alzheimer’s disease. In 1987, my dad broke his hip in a fall that spelled the beginning of the end. He had cancer and the fall gave us the knowledge that the cancer had spread everywhere. I was 14 and in high school and mom worked full time. But, we brought dad home with home hospice and for as long as we could, mom and I took care of him. We got him up, to the bathroom, to his recliner, back to the bathroom, back to bed. Sometimes mom and I worked together, other times it was just me with dad, or just her, but most of the time, it was the two of us. When we could no longer take care of him, he went back to the hospital, and died. Before he died, he whispered to me to take care of mom. In 1997 mom moved to Fairbanks, Alaska and I stayed in Seattle. Over the next six years, mom showed how strong she was, driving herself to the hospital after a heart attack. She also suffered a TIA. Feeling the need to spend some time with her, in 2003 I moved to Eagle River, Alaska, where she had moved the previous year. I had only planned on living there for a year, and just spending the winter with mom. I was going to refocus my photography and decide how I wanted to proceed with a photo career. A week after getting to Alaska, mom was diagnosed with heart failure. My year in Alaska turned into nine years. In 2007 mom underwent heart surgery to replace a couple valves. Later in the year she got a pace maker. For almost the first year following her surgery, I slept on a love seat feet from her bedroom in case she needed something or needed to get up to go to the bathroom. Following her surgery, her dementia, or Alzheimer’s progressed greatly, but she rebounded some. Her mind was going, but slowly. My family all lived in Alaska, my brother in Fairbanks, and my sister with her husband and youngest son in Eagle River. In 2012 my brother-in-law took a job in Denver, and mom and I followed. The winters in Alaska were just to harsh for mom. Soon after we arrived in Denver, my brother followed. Following the move to Denver, moms dementia started to really progress. I was shooting, multiple high schools, the University of Colorado, and pro and olympic level sports. But as time went on, I had to step away from photography because mom could not be left alone for extended periods of time. I started working from home so I could take care of mom better. That 24/7 care went on for over 3 years. Mom was very mobile, once she got up. During the day, she needed help getting out of bed, or out of her chair, off the toilet, but once she was up, she would grab her walker and was off to the races. During the night, during a dementia episode, she would get up and get ready for church, work, school, to go find her mama, or to take the stuffed dog she carried with her everywhere out side to potty. I literally slept in 15 minute to 30 minute bursts to make sure she was not escaping. On Father’s Day, 2017, mom and I came out of her room after getting her dressed, and she parked her walker like she always did and turned to take the two steps to her chair as I went to the kitchen to fix her breakfast. She fell and I was on top of her in seconds. She said she was not in pain, and there was no sign of injury. After making sure she was ok, I helped her up and she waked from where she fell to her chair and sat down. I brought her breakfast out and she scarfed it down and drank a whole glass of water. I refilled her water and went to the computer, just a few feet from her and began work. When lunch rolled around, I asked her if she could feed herself or if she needed me to. Breakfast she always ate on her own, but with lunch, it was sometimes that she would feed herself, other times I had to spoon feed her. Dinner, I always had to feed her. She took two bites and said she was done. I tried to feed her but she passed out. I got her to wake up, but she was very lethargic. I picked her up to take her to my car to get to the hospital, but she passed out again. So I woke her up, and called 911. An ambulance came and took her to the hospital. It turned out she had a UTI that we did not know about, and she was dehydrated. She had been drinking, but just not enough. They admitted her and discovered her kidneys were not working right and her blood pressure was way low. So, following a CT scan after a couple days in the hospital, they discovered to fractures to the pelvis. They got her stabilized, but her kidneys refused to work right. Doctor said if she is going to get better, it will be at home. After a week they discharged her to home hospice. We had a hospital bed delivered and she came home. I started sleeping on the love seat again, just feet from her, and would feed here, try to get her to drink, and change her. It was very demanding physically and emotionally, but I did everything I could for her. Everyday at home she told me she did not want to die. She asked how to get better, and I told her she needed to eat and drink. She would eat some, but not enough, and when she drank, she struggled. I got her drinking apple and grape juices as well as Ensure protein drinks. 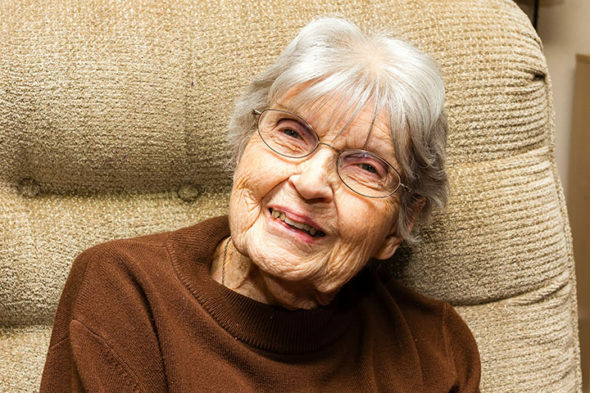 She loved applesauce and fruit cups, but the dementia started to make her forget how to swallow. After a week at home, mom died on Sunday, July 2, at 9:30 p.m. Earlier on Sunday, my brother, sister, and brother-in-law came to see her, and that was when mom said her good-byes, whether they knew it or not. At about quarter after 9 that night, she told me she loved me, that she was scared, and gave me a kiss. I told her I loved her, and that there was no reason to be scared, I was right there with her, and would be here when she woke up wanting to eat. She smiled and fell asleep. She snored for about 15 minutes and then just stopped breathing. After more than 12 years taking care of her, she was gone. I immediately started going through the condo we live in because I cannot take over the payments. The job I currently have does not pay enough, and I am scared. I am trying to get everything packed, and am hoping that I will be able to stay through the end of August while I try to sell it. Profit from the sale will go to paying off final bills, and hopefully get me into an apartment. One of the plans is to trade my car in for a newer (2010) Saab and start driving for Uber or Lyft during the day, and then pick my shooting back up in the evenings. Without mom to rush home to take care of, or worry about, I can focus on photography and hopefully start making money quick. Between driving, and shooting, I hope to start upgrading my gear, like maybe picking up a couple 1D Mark IV cameras, and a couple long, used lenses for football, baseball, soccer and other field sports. Right now it is a sad time, and a scary time. I have not fully relaxed yet. I have gone through moms room and packed what I am keeping, took stuff to my brother and sister that mom wanted them to have. I am currently going through my room and packing and throwing away a lot. After that, the kitchen, dining room and living room will be packed and I will clean the condo and get it listed for sale. I may have one opportunity to sell it quickly, and they will let me stay in the condo for 30 days after closing so I can find a place to live. For the time being, I want to stay in the Arvada area so I can continue to shoot the schools that I know already. For now, that is where I am at. I appreciate your prayers and positive thoughts. This entry was posted on Thursday, July 20th, 2017 at 11:53 pm	and is filed under News, Reviews, and Tips and tagged with dementia. You can follow any responses to this entry through the RSS 2.0 feed.